1-DO WE NEED CONTINUOUS MEDICAL EDUCATION? LEADING ARTICLE The physician is an active member of the society. He interacts with it, influences and takes care of it. His duty is not only to cure patients, but also to take the necessary procedures to reduce errors and to lessen the harm resulting from these errors on the health of the patient. Such faults and errors may seem travail, but they are serious however tiny they are because they are related to the divine and precious life of the human being. Despite important advances in surgical care and minimized surgical trauma, postoperative complications are still of great concern. Nutritional depletion has been demonstrated to be a major determinant in the development of postoperative complications. Nutritional status of gastrointestinal surgical patients is an important issue, which need to be attended in particularly during the perioperative period. Fears of postoperative ileus and the integrity of the newly constructed anastomosis have led to the adoption of starvation with administration of intravenous fluids until the return of normal bowel sounds and passage of flatus. However, it has been shown that early postoperative enteral feeding is both beneficial and well-tolerated. Meta-analysis has shown that enteral feeding compared with parenteral nutrition is associated with fewer complications, reduced costs and a shorter hospital stay. Therefore it should be the preferred option whenever possible. Evidence to support preoperative nutrition is limited, but malnourished individuals fed for 7-10 days preoperatively may have improved surgical outcome. Prolong preoperative starvation is not essential, and the administration of preoperative carbohydrates is safe without the fear of increasing the risk of aspiration. Initially nutritional support was aimed at meeting the energy needs and providing proteins and other essential micronutrients, while now it is more directed at modulation of the immune functions, the so called immunonutrition. Multimodal strategies including minimal invasive surgery, adequate postoperative analgesia, nutritional care, and enforced mobilization resulted in reduction in postoperative complications and length of hospital stay. OPEN ABDOMEN, WHAT IS NEW IN ITS SURGICAL MANAGEMENT? Open abdomen is a concept that the abdomen is left open after laparotomy especially when it was done as emergency for traumatic abdomen or reopens the abdomen when signs of increase intra-abdominal pressure (IAP) causing abdominal compartment syndrome (ACS). This open abdomen must be covered temporarily till the signs of abdominal compartment syndrome (ACS) disappears and intra-abdominal pressure (IAP) returns normal, then reclose the abdomen by one of definitive procedure. It was found that Vacuum-assisted wound closure (VAWC) is the best temporary procedure to close the abdomen to get early or late fascial closure as the best definitive closure of open abdomen. Also It was found that the classification of open abdomen is so helpful in choosing the procedure for temporary and definitive closure, this classification is new thing and dependable. IS IT SAFE NOT TO LIGATE THE INFERIOR THYROID ARTERY DURING SUBTOTAL THYROIDECTOMY? A palpable thyroid nodule is a common clinical problem; the ultrasonography (US) and fine needle aspiration biopsy (FNA) are its main diagnostic tools. This article aimed to study the reliability and advantages of ultrasound as a diagnostic aid in predicting malignancy in thyroid nodules and to reduce the number of unnecessary surgery. Two hundreds and thirty three patients were examined by ultrasound, and then fine needle aspiration cytology under ultrasound guidance (US-FNAC) was done for 210 of them. From those 210 patients we obtained the histopathological proof of 58 patients who underwent surgery. We calculated the sensitivity, specificity and accuracy of US-FNAC. There are certain sonographic criteria that suggest malignancy these include microcalcification, irregular margins, and hypoechogenicity of the nodule. The sensitivity, specificity, and accuracy of US-FNAC were 80%, 96%, and 94% respectively. Although ultrasound can not reliably distinguish benign from malignant nodules, but it can identify suspected nodules based on certain sono-graphic criteria. 7-CAN CYSTIC ARTERY CAUTERIZATION BE SAFELY PRACTICED IN LAPAROSCOPIC CHOLECYSTECTOMY? This study aimed to evaluate the safety and efficacy of cystic artery cauterization in laparoscopic cholecystectomy (Lap.Chole.) and to outline possible complications and limitations that might arise from adoption of such approach. Cauterization of the cystic artery was adopted as the principal mean of securing the cystic artery in the course of standard lap.chole. The technique was applied on 46 cases of laparoscopic cholecystectomy. Patients with adhesions in the triangle of Calot and/or very short cystic arteries were excluded from the study. All patients were followed up for 2-3 weeks. We didn't get any serious complication in form of: major bile duct injury, right hepatic artery injury, post operative hematoma. Mean operative time was 35 minutes. Out of the 46 patients who had cystic artery cauterization we had the following complications: one patient developed intra-operative bleeding from the cystic artery in the course of its skeletonization which was controlled by prompt clipping, another patient developed rather severe bleeding from a torn cystic artery and we converted him to open cholecystectomy. Forty one patients were females (age range 18-48 years) and 5 were males (age range 33-49 years). Complications occurred exclusively in females. Apart from conversion due to other causes, the incidence rate of conversion due to bleeding from cystic artery during clipping and cauterization was 1.5%, 2% respectively. CAN CYSTIC ARTERY CAUTERIZATION BE SAFELY PRACTICED IN LAPAROSCOPIC CHOLECYSTECTOMY? Auricular reconstruction represents a meticulous reconstructive and aesthetic problem to the plastic surgeon. One of the greatest challenges in facial plastic surgery is total ear reconstruction. The ability to reconstruct a fully satisfactory complete external ear has for centuries been an elusive goal. The most promising field of advances with the hope of eventually clinical utility lies in the realm of bioengineering with cultured cartilage. To date, no perfect material has been found to substitute for the sharply elastic cartilage normally present in ear, the matter of total auricular reconstruction remain very complex, Prosthetic restoration is not favored by most but does remain available option for many patients. Tissue engineers have waited to create a precise three dimensional auricular reconstruction neocartilage. Ten patients were operated upon for auricular reconstruction in Basrah Alsader Teaching Hospital. The operation had 2 stages: First stage, creation and implantation of framework cartilage graft, which harvested from the 6th ,7th & 8th ribs. The second stage, was detachment of the constructed auricles ear lobe transposition and post auricular sulcus was defined by separating the constructed auricle from the head covering the under surface with a thick split thickness skin graft. The success rate was 90% with good and satisfactory result except in one case; there was infection with loss of the cartilage. To estimate the incidence, indications, risk factors and complications associated with emergency peripartum hysterectomy, we analyzed retrospectively all cases of emergency peripartum hysterectomy performed at Basrah Maternity and Children from 1st of January 2005 to 31st of December 2007. Emergency peripartum hysterectomy was defined as one performed for hemorrhage unresponsive to other treatment less than 24 hours after delivery. There were 20 emergency peripartum hysterectomy among 51,121 deliveries for a rate of 0.3/1000. Fifteen women (75%) were delivered by caesarean delivery. Eighteen women were multiparous and 2 were primiparous. Most frequent indications were placenta accrete (60%), 9 with praevia and 3 with out praevia), followed by uterine atony in (20%), uterine rupture in (10%), extended cervical tear in (5%), and retroperitoneal haematoma in 5%. Placenta accreta was the most common indication in multiparous women (66.6%, 12 of 18) while uterine atony was the most common in primiparous. Eleven out of 12 (91.7%) women with placenta accrete had a previous caesarean delivery. Three (25%) had a previous one caesarean section and 8 (66.6%) women had .2 previous caesarean section. Fourteen (70%) of hysterectomies were subtotal. Intraopeartive complications were (15%) and Postoperative febrile morbidity was (60%).We concluded that placenta accreta has become the most common indication for emergency peripartum hysterectomy. The number of caesarean deliveries increased the risk of placenta accreta proportionally. Orthopaedic surgeons often remove foreign bodies from the extremities. If the foreign body is radio-opaque, it can be located using conventional radiographs or fluoroscopy. However if the foreign body is a radiolucent object, it may not be detected by radiograph leading to serious complications. The aim of this paper is to discuss the role of US in detection of non radioopaque foreign body in addition to the presentation and nature of the foreign body. Twenty patients with penetrating injuries to the extremities were treated from January- December 2008 at Samawa General Hospital. They were 11 male and 9 female, their ages ranged between 4 to 50 years (average 22.7). All patients were evaluated by detailed history, clinical examination, radiography and US which were done at the department of radiology in Samawa General Hospital. The lower limb was affected in 14 cases (70%) while the upper limb in 6 cases (30%). presenting symptoms were; pain (16 cases) followed by swelling (3 cases), limping and discharging sinus (one case). No foreign bodies were detected by radiography in this study. On the other hand, US detect and localize foreign body in each case. Fifteen patients had history of failed previous interventions for removing foreign bodies. In conclusion, Non radio-opaque foreign bodies are common in children and adults most often presenting as penetrating injury to the extremities. Failure to remove it may lead to serious complications and malpractice lawsuits. US has emerged as the study of choice for detection of radiolucent foreign bodies. This study aimed to evaluate the use of surgicel as the primary hemostasis method in tonsillectomy. It is a cross-sectional prospective study included 211 patients who underwent tonsillectomy alone or with conjugation with adenoidectomy over a period of 4 years in a tertiary centre. The surgeon used cold steel dissection and surgicel as primary Hemostasis technique. There was no post-tonsillectomy hemorrhage in this study, giving a 0% risk of post tonsillectomy bleeding. It is concluded that the use of surgicel is a valid technique to achieve hemostasis in tonsillectomy. Larger number of patients has to be operated on using this technique in order to validate the comparison between our technique and techniques currently used. Nutritional status of the women has been considered as an important prognostic indicator of pregnancy outcome and risk of preterm birth. Few studies have evaluated the patterns of body mass index in developing regions where malnutrition and poor weight gain as well as maternal obesity have significant influences on the pregnancy outcome. This study aims to show the effect of pregnancy body mass index on the incidence of preterm labour. 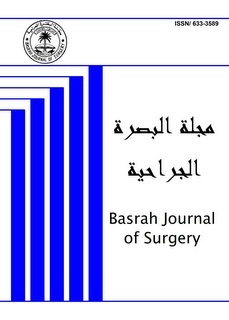 This is a prospective descriptive study of 200 women attended Basrah Maternity and Child Hospital who were diagnosed with preterm labour were recruited in the study. Patients were classified into categories that were based on their body mass index (BMI) according to the national institute of health guidelines. Rate of spontaneous preterm birth were determined. Women with body mass index <19 kg/m2 had 34.5% of spontaneous preterm labour, with BMI 19-24.9 kg/m2 had 28.5% of spontaneous preterm labour, while those with BMI 25-29.9 kg/m2 had 21% of spontaneous preterm labour, women with BMI 30-34.9 kg/m2 had 14% of spontaneous preterm labour and with BMI >/35kg/m2 had 2%of spontaneous preterm labour. Risk of spontaneous preterm labour tend to progressively decrease with increasing body mass index. Thinner women who have preterm delivery tend to deliver at earlier gestational age than women who were obese 42.3% of non obese women deliver before 30 weeks of gestation compared to 25% of the obese, 44% of non obese deliver at gestational age 30-40 weeks compared to 28.25 of the obese. In conclusion, high body mass index is associated with a lower rate of spontaneous preterm birth. This prospective study includes 80 eyes of 78 patients with cataract, who had manual phacoemulsification operated upon by the same surgeon at Basrah Hospitals between Feb, 2006 and Jul, 2007. They were 35 males and 43 females, 2 of them (females) have cataract in both eyes. The age of patients range from 35-70 years, 23 eyes of 21 patients (28.7%) at age of between 35-45 years, 20 eyes (25%) at age of between 46-55 years, 27 eyes (33.7%) at age of between 56-65 years, 10 eyes (12.5%) at age . 66 years. The pre-operative visions for those patients were ranged from 6/24 to projection of light (PL), depend on the type and extent of cataract. There was selected with no significant corneal astigmatism in all of these patients. Surgery was done on 21 eyes (26%) with posterior subcapsular cataract, 20 eyes (25%) with nuclear cataract, 30 eyes (38%) with mature cataract and 9 eyes (11%) with hypermature cataract. On the first postoperative day, according to Oxford Cataract Treatment and Evaluation Team Grade (OCTET) classification the observation was: Grade 0 was reported in 46 eyes (58%), Grade I developed in 25 eyes (31%), Grade II developed in 8 eyes (10%), and Grade III developed in 1 eye (1%). On the 7th postoperative day, 54 eyes (67.5%) had Uncorrected Visual Acuity (UCVA) of good outcome, 23 eyes (28.7%) had of borderline. On day 40 postoperative, 75 eyes (93.7%) achieved a best corrected visual acuity (BCVA) of good outcome. The final refractive states in 73 eyes (91.2%) was emmetropic or within (-1) diopteric sphere of the desired refractive target without a significant astigmatism. The objective of the present study is to evaluate the clinicopathological characteristics of labial mucocele. Eighteen cases of labial mucocele were studied, a special protocol was designed and clinical & histopathological variables were recorded. Only one mucocele occurred in the upper lip, the rest being in the lower lip. One was bilateral. Of the mucoceles examined, 88% were of the extravasation type and 11% were retention. Of the 16 classified as of the retention type, 12.5% were in the initial stage, 31.25% in the resorption stage and 56.25% in the final stage. It is concluded that diagnosis can be established from clinical details although a histopathological study is necessary to confirm the diagnosis. Tendency to heal with an abnormal scar7. The external ear is most prone to unfavorable wound responses such as keloids8. Earlobe keloids are common response to ear piercing, especially in females and darker skin individuals9. Keloids on the ears present several therapeutic challenges. They are common after small skin excisions and other procedures, including drainage of auricular hematomas, repair of other auricular traumas or as secondary keloid formation after prior keloid excision. Several treatment modalities are used for keloid such as surgery alone or surgery combined with other measures with varying success rates. Today there is no agreement about which treatment modality will significantly solve the problem10. This paper report a case of a large bilateral post burn ear keloid on the helical rim which was successfully treated with surgery and intra-lesional injection of 5FU and Triamcinolon. Authors: Thya Al-Saadiat --- Zuhair Al-Barazanchi. Introduction Giovanni Di Guglielmo first described erythroleukemia, a leukemia composed of purely erythrocytic precursors in 1926, and the disorder is often still referred to as acute Di Guglielmo syndrome. It is classified as an M6 subtype of acute myelogenous leukemia (AML) in the French- American-British (FAB) classification system based on morphologic and cytochemical criteria1a. Acute erythroleukemia accounts for 3-5% of all de novo AMLs and 20-30% of secondary leukemias. It is very rare in children. The incidence of erythroleukemia increases in people older than 50 years2 Mazzella et al (2000) described 2 peaks, one in the seventh decade of life and a second, smaller peak in the fourth decade of life.